The house is a newly renovated modern rustic hillside home located on the border of 22,000 acres of untouched wilderness. Views of the Catskills and a a long list of outdoor activities right in the backyard: climbing, fishing, hiking, swimming, skiing, snowboarding, snow shoeing, etc. And if you just want to stay at home you can relax in the hot tub, hang out on the deck or by the fireplace. Only 2 hours from NYC, the house is a bright 3BR house with wraparound deck sitting on 5 acres of gorgeous green property. Our house is perfect for any weekend getaway or vacation with family and friends. Year-round, guests can soak in the outdoor hot tub, stargaze from the porch and roast marshmallows around our secluded fire-pit with mountain views of the Catskills. You can walk through our backyard straight into Minnewaska State Park, home to hundreds of trails for hiking and some of the best climbing in the northeast. Spend the summer weekends, camping, hiking and grilling outside. During winter, enjoy nearby winter hiking, snowshoeing, or cross-country skiing. We’re also a quick 20 min to the Shawangunk Mountains (or, the “Gunks”), famous among rock climbers—home to waterfalls like Verkeerderkill, Awosting, Buttermilk and VerNooykill. If fishing is your thing just walk down the driveway to the Rondout creek. The space Two floors, 3 bedrooms—downstairs we have a full kitchen (and dishwasher!) and living room with Sonos speakers and a working woodstove.The bedroom downstairs has 2 full-size beds and two bedrooms upstairs—one with a queen and the other with king with ensuite bathroom and private balcony. Guests will find the home stocked with all the necessary amenities including towels, linens, and kitchen basics as well as toiletries. Forget something? Wal-Mart is 5 minutes away and you have quick access to a number of restaurants in Kerhonkson, Accord, High Falls, Stone Ridge, and Rosendale. New Paltz is just 25 minutes away. We are just a phone call or text message away and can provide recommendations or help if needed. 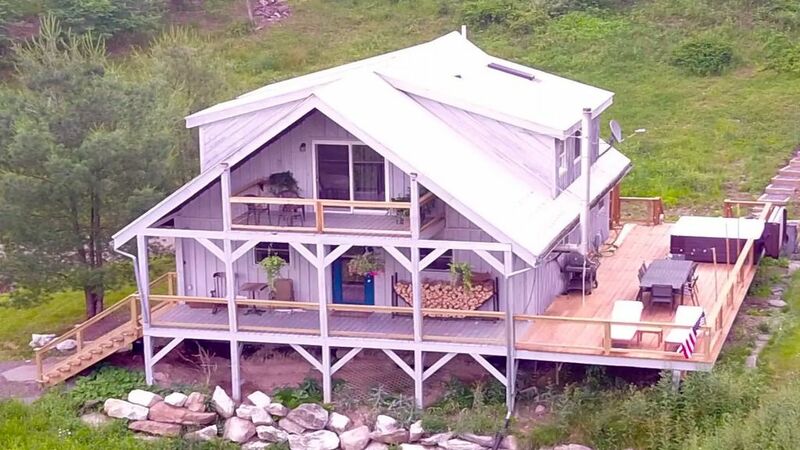 The house is secluded on a backroad that follows the Northwestern edge of the state park but a short 25 minute ride from the beautiful New Paltz and historic Kingston. Just 2 hours from New York City. A car is highly recommended. There is a bus from NYC Port Authority Pine Hill Trailways running about once an hour, $40 per person round trip to New Paltz. From there you can take a taxi, which would be about $25 each way. This is great for friends who do not have a car. Hey, I am from Boston, MA. I live in New York City and I am currently working in technology. I love to travel, hike, and be outdoors. If you have any questions about me don't hesitate to ask. Casa Minnewaska is the ultimate getaway from NYC and an awesome vacation home for people who want to be outdoors. It is located directly over Minnewaska State Park (we have deeded rights from the backyard into the park), which is home to some of the best hikes or climbing in the northeast. But, for those who just want to relax, we have a hot tub and wraparound deck. We are also close to ski mountains, casinos, and excellent restaurants. I had such a wonderful time at David & Jan's house in Kerhonksen. They have literally everything you could want for a weekend away from NYC — we hung out in the hot tub all night and listened to music after grilling on the huge porch and roasting marshmallows by the firepit. I can't wait to go back!!!!!!!!! Thanks Lindsey! It was great having you. Hope to have you back.